Concert audiences are familiar with their work, and now they pool their extensive experience in concert as . . . . Three Phantoms In Concert. 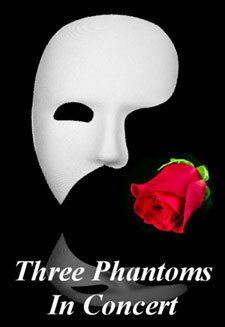 The Three Phantoms program features solo numbers from the shows that made them the stars that they have become. The concert will also feature duets and trios, all from the Broadway male repertoire. In addition to songs from Les Misérables, Miss Saigon and The Phantom Of The Opera, and program may include numbers from Guys And Dolls, Annie Get Your Gun, Kiss Me Kate, South Pacific, The Secret Garden, Jesus Christ, Superstar, Damn Yankees, and many more. This program is available for engagements with Symphony Orchestra or piano.